Vangoddy's Irista 10-inch Sleeve bag is incredibly light, stylish and portable. Crafted of durable friendly leather with fine stitching. 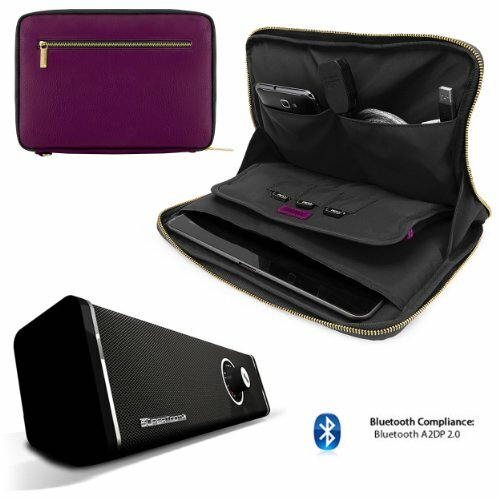 The bag has extra foam padding all around protecting your device from any bumps dents and scratches. It features durable gold zipper/fixtures that allows you to access your stuff with no hassle. The interior is feature with Microsuede anti scratch material. Irista bag was designed to stand up to everyday wear and tear, and it will retain its good looks over time. Built with plenty of organized storage, the main compartment measures 11.25" x 8" x 1" and across on the opposite side of the main compartment you will find 2 extra pockets measuring 8" x 5.75". The sleeve also has a unique feature, a center flap that includes a memory card slot, credit card slots and cellphone/mp3 pocket measuring 6" x 3.75". The Irista bag takes mobility to a whole new level. Maneuver from the office to the classroom or anywhere you need to go. Here's a bag that's incredibly light yet easily accommodates your main device with accessories and some daily items that you normally carry in your pocket. If you have any questions about this product by VangoddyCase, contact us by completing and submitting the form below. If you are looking for a specif part number, please include it with your message.